Christmas as we know it was a creation of the Victorians. Here are four Christmas calamities unearthed by Jeremy Clay, the author of The Burglar Caught by a Skeleton, a collection of bizarre stories from Victorian newspapers. In hindsight, the outfit may have been a mistake. After dressing up in a makeshift Father Christmas costume fashioned from luxuriant quantities of cotton wool, Otto Krellwitz took himself off to the swankiest do in town. The well-heeled folk of Houghton, Michigan, had been looking forward to the masquerade ball for weeks, but it's fair to say the night didn't go quite as planned. "The dancing and hilarity were at their height," reported the Midland Daily Telegraph in February 1891, "when an untoward accident occurred which brought the proceedings to an unexpected termination, and for a short time seemed likely to end in a catastrophe." In his snowy, flammable robes, the hapless Krellwitz was dancing and pirouetting with great vigour when he careered into a boy dressed as a ghoul who was carrying a candle. Almost at once, Father Christmas was ablaze. "The ladies near him started screaming," said the Telegraph, "and the place was immediately thrown into a state of the utmost commotion, some of the dancers rushing to the doors to get out, whilst others ran to Krellwitz's assistance. "The latter, however, losing all presence of mind, ran frantically about the saloon, setting fire to the costumes of all with whom he came into contact. "For several minutes the scene was almost indescribable. A perfect panic reigned, those whose clothes were on fire rushing wildly about to the danger of others." Many of the guests were severely burned. As for Krellwitz himself, "it is feared that he and one or two others may succumb to their injuries". But the warnings were there, to anyone who cared to read them in the newspapers. Only a few weeks before, AC Taylor, the dispenser at Peterborough Infirmary, had dressed as Santa Claus, with a "flowing hirsute appendage of cotton wool", to hand out gifts to patients from the tree. You can guess what happened next, but it seems to have come as a surprise to Mr Taylor, whose moustache and eyebrows were singed off, and his head badly burned. "Fortunately, a panic among the inmates was prevented," said the Sheffield Evening Telegraph. Two years earlier, a fancy dress ball near Dun Laoghaire in Ireland, a guest called Mr Deane arrived dressed as Father Christmas and soon contrived to catch fire. "He was quickly enveloped in flames," said the Western Daily Press. "His wife, to whom he was only recently married, rushed to his assistance, and unfortunately her clothes also became ignited." The quick-thinking son of the host ripped the cloth from the billiard table and threw over them both. It did the trick, but not before he was burned too. Still the lessons weren't heeded. In 1893, at the National School in Grays, Essex, during a performance of The Story of a Christmas Pudding, a boy called Frederick Smith strayed too near the footlights and his costume was rapidly ablaze. For a moment, pandemonium reigned. But cometh the hour, cometh the man, in the superhero shape of teacher Mr Pean who earned the biggest cheer of the night by leaping on to the stage and putting out the flames with his bare hands, which were badly burned. "The lad himself was none the worse for the adventure," reported the Essex Newsman, "except that his cheek was slightly scorched." A frosty street in Victorian England. A bleak midwinter's night. A merry huddle of carol singers, wrapped up against the biting cold, their voices joined in tidings of comfort and joy. Everything was exactly as a hack Christmas card artist might have sketched it, right up until the moment a shot rang out and one of the carollers slumped to the ground. It happened in the small hours on 25 December 1886. Loath to call time on their booze-enriched evening, a gang of pals was making its way through Clapham, singing. "Let's call at the Rising Sun," one of them must have suggested. "The landlord would enjoy that." In this, as we shall see, they were sorely mistaken. It was gone 01:00 when they burst into the back yard of the pub and let rip. They had flutes and a clarinet. A drum too. Well, a tin bath they'd found by the bin, which they were beating enthusiastically with a stick. Inside, James Gardiner was rudely awakened by the hubbub. For quarter of an hour, he suffered in silence, then could take no more. He inched open his bedroom window, and yelled at them to stop, reported the Pall Mall Gazette. 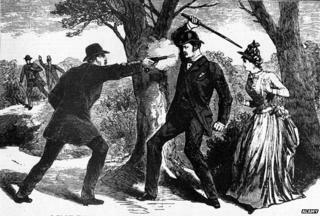 "Not heeding his request, they continued to sing, and Gardiner, without further parley, fired a six-chambered revolver." Father-of-two Robert Janaway was hit in the side. The window flung fully open. "Have I shot anybody?" Gardiner called out, tentatively. "You've shot Bob," a voice shouted back. And with that, as Janaway's brother William would later testify, "there was a rare fuss". William and his friends carried Robert home and then on to the hospital, but he died after undergoing emergency surgery. When a policeman arrived at the pub, he found the landlord in his night-dress, sobbing with grief. He hadn't meant to hurt anyone, Gardiner said. He merely wanted to scare them. As it turned out, he managed both. Like thousands of British soldiers in the mid-19th Century, James King gave his life for Queen and Country. Unlike his brothers-in-arms, he didn't die in the killing fields of the Crimea. No, Pte King fell in Hampshire, in the long-forgotten Battle of Christmas Dinner. You'd be forgiven for never having heard of it. It wasn't the bloodiest. It wasn't the lengthiest. It wasn't the most significant. But it was certainly the weirdest. One side, stood the British Army. On the other… Actually, that was the British Army too. Hostilities broke out Christmas Day in 1859. The 24th Regiment of Foot and the Tower Hamlets Militia had been sharing a barracks in Aldershot. They'd eaten their Christmas dinner, served, as was the custom, by the officers, who had then left the troops to their own devices. When the soldiers mingled afterwards, replete and content, talk turned to the meal they'd just scoffed. The Tower Hamlets Militia had dined on beef and pudding, washed down with a pint of beer each. Ours was better, sniffed the men of the 24th, who'd eaten goose. The row began harmlessly enough, but, in the way of these things, it soon escalated. Voices were raised. Words were exchanged. There was a push. Then a shove. Mops and brooms were commandeered as weapons. Somebody lobbed a few rounds of coal. Someone lobbed a few back. Salvos of coal were exchanged. There was a great crash of glass. Then, with the mood darkening, some of the 24th went to fetch their rifles, and began loading them. Pte King had been singing Auld Lang Syne with his pals when a volley of fire erupted from across the parade ground. "I am shot," he cried, then collapsed. "I felt for the wound, but could not find it," Pte George Sawyer told the inquest into King's death, "and told him he was only larking, but a comrade pulled up his shirt, which was bloody, and then we saw a little hole, bleeding slowly." The guns blazed for up to 10 minutes, and when they fell silent, almost every window in the block was smashed, and the walls, doors and windows were peppered with bullet holes. The 24th, who shouldered the blame at the inquest, were ordered to leave camp for Cork. Their voyage from Portsmouth lasted nearly six days, reported the Reading Mercury: "The men on landing looked in anything but good condition." It was justice, of sorts. To coincide with the Commonwealth Games, Jeremy Clay scoured contemporary newspaper reports to find tales of the most unusual Victorian sports, including pigeons racing bees and a man wrestling a bear. If she'd dared to imagine the very worst thing which could happen on her wedding day, the bride-to-be couldn't possibly have got close to the truth. It was bad enough that her guests fled the reception. It was worse that the house blew up behind them as they ran. But all wasn't lost, until the murderous gunfight which followed. Festival goodwill was in fairly short supply in and around the mining town of Hazleton, Pennsylvania, on Christmas Day 1893. Just up the road, a free-for-all brawl between 50 men left two shot and two more stabbed, but it was the Polish wedding in town which really took the biscuit. For quite some time, there had been bad blood between the Poles and Austrians of Hazleton. That regrettable state of affairs wasn't helped by the decision of some dastardly Austrians to pack dynamite into the house where the happy couple would return as husband and wife. The fuse was about to be lit when one of the Austrians felt a sudden pang of conscience and let slip that the best man's speech wasn't going to be the most charged part of the afternoon. As the guests scarpered, the house exploded. When the smoke cleared, the furious reprisals began in a frenzied fire-fight. A dozen were shot, and many more injured by lunging knives and thwacking clubs. Somewhere amid the melee, the groom was killed. So all things considered, maybe the headline in the Middlesbrough Daily Gazette didn't really convey the jaw-dropping turmoil of the day: Lively Conflict at a Wedding.